Did you know you can use your bread maker to perfect these delicious little treats? Simply add the ingredients to the bread pan, start the dough mode and your bread maker will turn out perfect dough every time. All you have to do then is fry them off, dust with powdered sugar, add your jam and enjoy! Made using the SD-2501 bread maker. Place the ingredients into the bread pan in the order listed. Set the machine to the BASIC DOUGH (2hrs 20mins) setting. MENU 16. When the program has finished divide the dough into 10 balls. Flatten slightly. Leave to prove until doubled in size. Deep fry, 4 at a time in hot oil (180 °C) until well browned. turning them frequently. Mix the lemon juice and jam together. 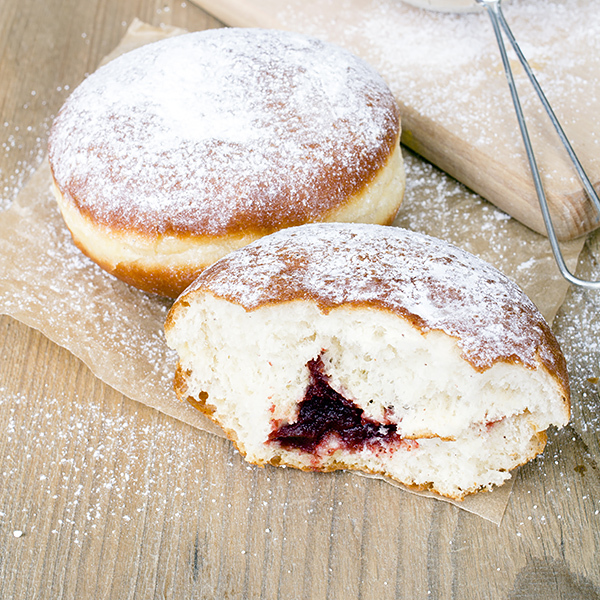 Fill cooked doughnuts with the jam using an icing syringe. Made using the SD-2501 bread maker: http://www.panasonic.com/au/consumer/household/kitchen-appliances/bread-makers/sd-2501.html.